Hello everyone! 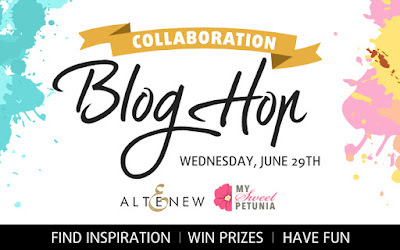 Today our Altenew DT is teaming up with My Sweet Petunia to bring you a fun collaboration blog hop full of inspiration! If you came here from Francine Vuilleme's blog, then you are on the right track. 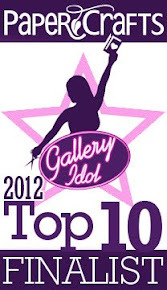 Otherwise, go back to Altenew blog and start from there, as you won't want to miss anything! Be sure to visit each blog for your chance to win! There are TWO mini MISTIs from My Sweet Petunia and THREE $30 gift certificates from Altenew up for grabs. 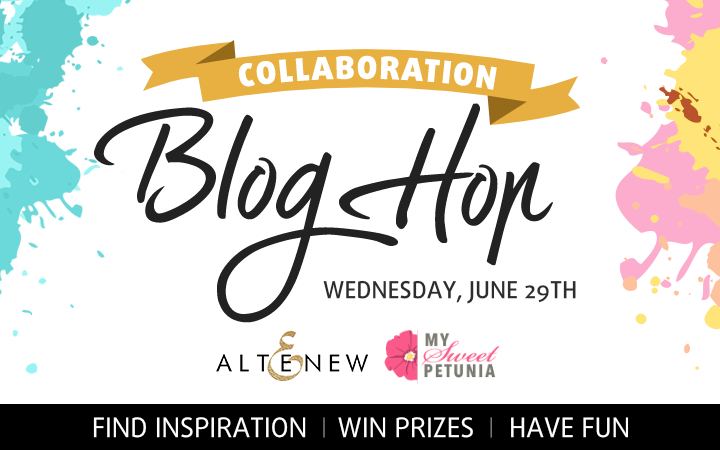 Winners will be picked randomly from the comments across all of the blogs in the hop and they will be announced on the My Sweet Petunia and Altenew blogs on July 3, 2016. Now onto my card. For today’s hop I created a stamped background using beautiful Vintage Flowers set. To stamp my pattern I used Mini MISTI and I love how this tool makes stamping quick and easy! Especially when it comes to using multi-layer stamps it really helps to line images up easily! I used here two shades of green (Evergreen and Forest Glades) and to finish my card, I stamped sentiment from Sohcahtoa set on a circle die cut. I again used MISTI tool to repeat a part of the pattern on the die cut panel and then popped it up with foam tape. That’s it for me. Your next stop on the hop is Ilina Crouse! Another green flower card on this hop. I need to think outside the box more. It turned out beautifully. Love the use of green. Nice card! Love the shades of green- so pretty. It reminds me of fabric! Beautiful green colors! Love this floral stamp! Getting ready for a four week (mostly business) road trip, so I have no business doing a blog hop!!! But, that shows how much I would love to win a Misti. I like your mmonochromatic design! What a gorgeous card, Aga! I definitely agree that the Misti makes stamping easy, especially when using the technique you used on your card. Perfectly lined circle sentiment die-cut! This looks like designer paper, it is so pretty. Thanks for the chance to win. I love that creative background and the unexpectedness! very pretty card. i just got this stamp set so anxious to try some of these ideas. What a beautiful background with your relaxing greens. This turned out just wonderful!!! That is really pretty, l love how a stamp can make great backgrounds. Wonderful job. Thanks for the opportunity to win such great products. Wow, who would have thought green flowers could look so amazing! Love the fading colors of your background. Great card. I love what you did with the sentiment! Your cards are always great but this one is really special. Thank you for sharing. Love the greens! Altenew and MISTI are perfect together. The color is so nice. I have this stamp on my wishlist. Thank so much for sharing. Pretty use of this stamp. Great card! I love creating my own backdrops too! I love your color scheme and placement! A simple card packed with great detail! Thank you for sharing your creative talent! This is wonderful. I love how you've created the background. Very pretty card---love the use of the color green. The more I look at your card, the more I like it. It really is lovely. Gorgeous stamping - this looks like designer paper!! Love the use of green..my favorite colour! Stellar card! Love the pattern you created! It reminds me of fabric. So pretty! Wow! What a beautiful card! Love the pattern background you created! Gorgeous card! Thanks for sharing! Beautiful background to spotlight your sentiment. Love how you continued your design onto the circle. Aga, this is truly beautiful! I love the green flowers and how your sentiment is popped up. I love you using the 2 shades of green!!!! and it spilling on to your sentiment circle!!!! awesome!!! Lovely background pattern and highlighted sentiment. SO simple looking yet so beautiful. That is so beautiful and restful. Beautiful background. Looks like professional printing. Beautiful. At first I thought it was scrapbook paper. A lot of work but worth it! Thank you for sharing your beautiful card. Love the use of green for roses. Beautiful card. Love the idea of using green as a color for roses. Thanks for sharing. Love the circle for the sentiment. Thanks for sharing! you create an stunning background so beautiful card! Love all th4e green and how you laid out the background. Great card. 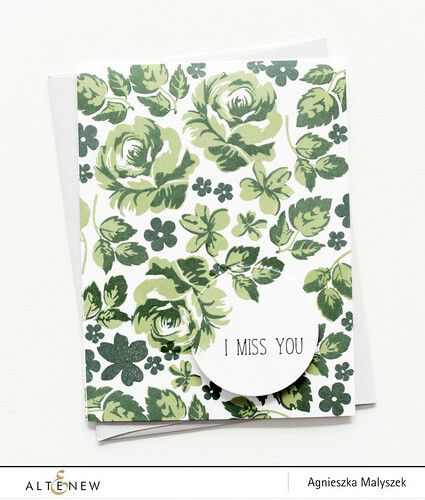 beautiful card.. looks like scrapbook paper.. nice idea..
Beautiful background in shades of green. Great point of interest you achieved with the partialy stamped pop up. Love the greens! Love the stamp and your great card design! Thank you. Great use of MISTI in making the background of your card! Green is a peaceful color with a cool feeling like a walk in the woods on a HOT summer day! Thank you for sharing how you used a misti to create this beautiful card. Love it. I need to make more simple cards. I love the green color theme. It makes the card very special. Beautiful card . Thank you for sharing. I love the beautiful background you made. Wonderful card design. This is very pretty in green. Beautiful! I never thought to use green for flowers, but I love it! Thank you for opening my eyes to alternate color schemes! I love how the green you used for all the stamped elements brings everything all together - and the raised circle makes for a cool "hidden depth" effect! Beautiful card. Love how you framed the sentiment. Unusual card in all green. Thank you for the idea. This is fantastic, thanks for the inspiration! Now that's a clever idea; thanks! love the monochromatic roses in green! Lovely background on your card. Thanks for sharing with us. I never do all over color...thank you and it's beautiful! I love how you did the background. Love the green too. What a beautiful background!!! Just stunning! Just BEAUTIFUL and done with only two colors! Beautiful card. I love how you created your own stamped background. Your card is very elegant, really great. Gorgeous card!! I need to use green more often! Thanks for sharing! Pretty card! Love the beautiful Vintage Flowers set! I love the monochromatic color scheme you created - beautiful card! Love the use of green in this card. Amazing stamping and a great design too. Such a gorgeous background and I love the leaves repeated on the focal image. So cute! What a beautiful card!! Never thought to use the shades of green for the blooms and the leaves!! I love it!! I love your card. it inspires. me. Really Beautiful card!! Love the green colors! How lovely! It reminds me of flocked wallpaper, but in a good way!! This is absolutely beautiful Aga. I adore this, just gorgeous! What a great way to create your own background paper. The MISTI and these great images work so well together. I would like to try that technique! TFS! I agree with others...very unique card! So brilliant to make multiple images exploding perfectly across the card, perfectly lined up!! Love it! Beautiful background stamping. I love the shades of green. Unexpected colors, but I love them in the background. Love the greens in this card. Very simply beautiful. Thanks for sharing. The greens and gray are a lovely combination! Brilliant!!! You never think of just using one color pallet...you totally open my mind. Thanks!!! What a unique card! I like how you stamped the sentiment and popped it on. I love your card with the colours you have used. It looks like some fabulous vintage fabric! Gorgeous card! I love the magnificent background you created and the popped up sentiment / focal point. Great color combination. I love the floral arrangement. What a creative use of the stamps. Love it! Thanks for the inspiration. I really like monochromatic pieces like the one you made- very cool. thanks for sharing it and also for the chance to win on the giveaway! Lovely. I'd not considered green for the flower. I like it, thanks! love how you partially put the flower on the circle too. All-over green tone is gorgeous! Really cool look you created with the green blooms. What a lovely card! The stamped background is awesome and reminds me of vintage wallpaper. Lovely! I love how the flowers continue onto the sentiment circle! I am in awe of your design - great stamping resulting in a gorgeous card. Great card and the Misti is a wonderful tool! Great card and love the layered colors used. great card, I love backgrounds and highlighted pieces. Very pretty. I really like how you added dimension. Fantastic card! I loved the idea of using green inks.that card would be great for st.patrick's day.thank you for the tutorial. Great card. Love all the green (my favorite color)! So pretty and I love the green flowers. I love your two shades of green. Very cool ( and I mean green is a cool color). LOL I would never have thought of green roses but I like your background, the over lapping leaves on the circle and the sentiment. Thanks for sharing your talent. Love the tone on tone look. Unusual colors . It looks great. Beautiful card. I love making my own backgrounds. tfs! What a lovely card! I would never think to do all green flowers but it looks gorgeous! I recently purchased the mini ink cubes from Altenew and cannot wait to play with them, especially the pretty gray and green cubes! Love your background and how it goes over the sentiment! Interesting outside the box thinking! Wow great use of one color. So cool! Looks like beautiful patterned paper. TFS! Great effect Aga and an unexpected use of colour. Fantastic card! Love the shades of green it makes for a gorgeous background or mimicking a fabric! 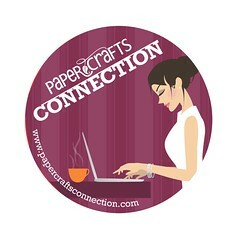 Thank You for sharing along in a fabulous blog hop! The flowers on this card are stamped so beautifully! I like the way you popped up the circle with the flowers continued on it. Love the colours you've used, such a beautiful card. Very unusual choice of color. Looks stunning! Thanks for the inspiration!